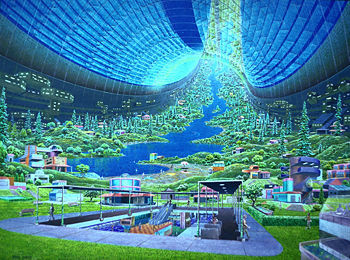 Artist's conception of a space habitat called the Stanford torus, by Don Davis. Space colonization (also called space settlement, space humanization, or space habitation) is the concept of permanent, autonomous (self-sufficient) human habitation of locations outside Earth. It is a major theme in science fiction, as well as a long-term goal of various national space programs. Many people think of space colonies on the Moon or Mars, but others argue that the first colonies will be in orbit. Several design groups at NASA and elsewhere have examined orbital colony feasibility. They have determined that there are ample quantities of the necessary materials on the Moon and Near Earth Asteroids, that solar energy is readily available in large quantities, and that no new scientific breakthroughs are necessary. However, a great deal of engineering would be required. To justify the colonization of space, supporters have given a variety of reasons, including survival of the human species (in case of nuclear warfare or other planetary catastrophe), protection of Earth's environment, access to additional natural resources, and the spreading of life in the universe. Critics of space colonization maintain that such attempts would be a waste of time and a drain on financial resources, which could be better spent on alleviating problems such as hunger, poverty, and disease. They also note that, whatever the merits, human travel beyond the Solar System is not feasible in any reasonable time period. To counter these arguments, advocates of space colonization observe that the pursuit of such a goal would stimulate the cooperative and unified efforts of people of various nationalities, and that the financial expense has been greatly overestimated. Building colonies in space would require a combination of many factors, including access to space, food, construction materials, energy, transportation, communications, life support, simulated gravity (using steady circular rotation), entertainment, and radiation protection. Several of these factors are discussed below. Colonies on the Moon and Mars could use local materials, although the Moon is deficient in volatiles (principally hydrogen, carbon, and nitrogen) but possesses a great deal of oxygen, silicon, and metals such as iron, aluminum, and titanium. Launching of materials from Earth is very expensive, so bulk materials could come from the Moon or Near-Earth Objects (NEOs, such as asteroids and comets with orbits near Earth), Phobos, or Deimos, where gravitational forces are much less, there is no atmosphere, and there is no biosphere to damage. Many NEOs contain substantial amounts of metals, oxygen, hydrogen, and carbon. Certain NEOs may also contain some nitrogen. Farther out, Jupiter's Trojan asteroids are thought to be high in water ice and probably other volatiles. Solar energy in orbit is abundant and reliable, and it is commonly used to power satellites today. There is no night in space, and no clouds or atmosphere to block sunlight. The solar energy available (in watts per square meter) at distance d from the Sun can be calculated by the formula E = 1366/d2, where d is measured in astronomical units. Particularly in the weightless conditions of space, sunlight can be used directly, using large solar ovens made of lightweight metallic foil so as to generate thousands of degrees of heat at no cost; or reflected onto crops to enable photosynthesis to proceed. Energy has been suggested as an eventual export item for space settlements, perhaps using microwave beams to send power to Earth or the Moon. The Moon has nights of two Earth weeks in duration and Mars has night, dust, and is farther from the Sun, reducing solar energy available by a factor of about 1/2-1/3, and possibly making nuclear power more attractive on these bodies. For both solar thermal and nuclear power generation in airless environments, such as the Moon and space, and to a lesser extent the very thin Martian atmosphere, one of the main difficulties is dispersing the inevitable heat generated. This requires fairly large radiator areas. Alternatively, the waste heat can be used to melt ice on the poles of a planet like Mars. Transportation to orbit is often the limiting factor in space endeavors. Present-day launch costs are very high—$25,000 to $78,000 per kilogram from Earth to Low Earth Orbit (LEO). To settle space, much cheaper launch vehicles are required, as well as a way to avoid serious damage to the atmosphere from the thousands, perhaps millions, of launches required. One possibility is air-breathing hypersonic air/spacecraft under development by NASA and other organizations, both public and private. There are also proposed projects such as building a space elevator or a mass driver. Transportation of large quantities of materials from the Moon, Phobos, Deimos, and Near Earth asteroids to orbital settlement construction sites would probably be necessary. Transportation using off-Earth resources for propellant in relatively conventional rockets would be expected to massively reduce in-space transportation costs compared to the present day. Propellant launched from the Earth is likely to be prohibitively expensive for space colonization, even with improved space access costs. Other technologies—such as tether propulsion, Variable specific impulse magnetoplasma rocket (VASIMR), ion drives, solar thermal rockets, solar sails, and nuclear thermal propulsion—can all potentially help solve the problems of high transport costs once in space. For lunar materials, one well-studied possibility is to build electronic catapults to launch bulk materials to waiting settlements. Alternatively, Lunar space elevators might be employed. Compared to the other requirements, communication systems are relatively easy to set up for Earth orbits and settlements on the Moon. Much of the current terrestrial communications already pass through satellites. Communications to Mars suffer from significant delays due to the speed of light and the greatly varying distance between conjunction and opposition—the lag would range between 7 and 44 minutes—making real-time communication impractical. Other means of communication that do not require live interaction, such as e-mail and voice mail systems, would pose no problem. People need air, water, food, gravity, and reasonable temperatures to survive for long periods. On Earth, a large, complex biosphere provides these. In space settlements, a relatively small, closed ecological system must recycle or import all the nutrients without "crashing." The closest terrestrial analogue to space life support is possibly that of Nuclear submarines. Nuclear submarines use mechanical life support systems to support humans for months without surfacing, and this same basic technology could presumably be employed for space use. However, nuclear submarines run "open loop" and typically dump carbon dioxide overboard, although they recycle oxygen. Recycling of the carbon dioxide has been approached in the literature using the Sabatier process or the Bosch reaction. Alternatively, and more attractive to many, the Biosphere 2 project in Arizona has shown that a complex, small, enclosed, man-made biosphere can support eight people for at least a year, although there were many problems. A year or so into the two-year mission, oxygen had to be replenished, which strongly suggests that they achieved atmospheric closure. Changing the environment to become a life-friendly habitat, a process called terraforming. Changing organisms (by genetic engineering) to become more compatible with the environment. A combination of the above technologies is also possible. Cosmic rays and solar flares create a lethal radiation environment in space. In Earth orbit, the Van Allen belts make living above the Earth's atmosphere difficult. To protect life, settlements must be surrounded by sufficient mass to absorb most incoming radiation. Somewhere around 5-10 tons of material per square meter of surface area is required. This can be achieved cheaply with leftover material (slag) from processing lunar soil and asteroids into oxygen, metals, and other useful materials; however, it represents a significant obstacle to maneuvering vessels with such massive bulk. Inertia would necessitate powerful thrusters to start or stop rotation. According to one proposed scenario, "self-replication" could be an "ultimate" goal, on the assumption that it would lead to a more rapid increase in colonies, while eliminating costs to and dependence on Earth. However, if such a goal were to imply human self-replication, it would treat people as machines, requiring genetic experimentation on humans and expecting that human nature and the human desire for a spouse and family life can be by-passed in some cavalier fashion. In another scenario proposed in 2002, anthropologist John H. Moore estimated that a population of 150–180 would allow normal reproduction for 60 to 80 generations—equivalent to 2,000 years. Researchers in conservation biology have tended to adopt the "50/500" rule of thumb initially advanced by Franklin and Soule. This rule says a short-term effective population size (Ne) of 50 is needed to prevent an unacceptable rate of inbreeding, while a long-term Ne of 500 is required to maintain overall genetic variability. The prescription corresponds to an inbreeding rate of 1 percent per generation, approximately half the maximum rate tolerated by domestic animal breeders. The value attempts to balance the rate of gain in genetic variation due to mutation with the rate of loss due to genetic drift. Location is a frequent point of contention between space colonization advocates. On a planet, natural satellite, or asteroid. In orbit around the Earth, Sun, or other object, or around a Lagrangian point. Mars is often the topic of discussion regarding "terraforming"—the process of making the entire planet or at least large portions of it habitable. Its overall surface area is similar to the dry land surface of Earth, it may have large water reserves, and has carbon (locked as carbon dioxide in the atmosphere). Mars may have gone through similar geological and hydrological processes as Earth and may contain valuable mineral ores, but this is debated. Equipment is available to extract in situ resources (water, air, and so forth) from the Martian ground and atmosphere. There is a strong scientific interest in colonizing Mars due to the possibility that life might have existed on Mars at some point in its history, and may even still exist (in the form of microbes) in some parts of the planet. However, its atmosphere is very thin, averaging 800 Pa, or about 0.8 percent of Earth's sea-level atmospheric pressure. Thus, the pressure vessels necessary to support life would be very similar to deep-space structures. Also, the climate of Mars is colder than Earth's. Its gravity is only around a third that of Earth; it is unknown whether this is sufficient to support human life for long periods. The atmosphere is thin enough, when coupled with Mars' lack of magnetic field, that radiation is more intense on the surface, and radiation shielding would be needed for protection from solar storms. It has been suggested that Mercury could be colonized using the same technology, approach, and equipment that would be used for colonization of the Moon. Such colonies would almost certainly be restricted to the polar regions, due to the extreme daytime temperatures elsewhere on the planet. Although the surface of Venus is far too hot and features atmospheric pressure at least 90 times that at sea level on Earth, its massive atmosphere offers a possible alternate location for colonization. At a height of approximately 50 km, the pressure is reduced to a few atmospheres, and the temperature would be between 40-100° C, depending on the height. This part of the atmosphere is probably within dense clouds that contain some sulfuric acid. The clouds could be a possible source for the extraction of water. It may be possible to colonize the three farthest gas giants with "floating cities" in their atmospheres. The speculation is that hot, hydrogen-containing balloons would be used to suspend large masses at roughly Earth gravity. Jupiter would be less suitable for habitation due to its high gravity, escape velocity, and radiation. Artist's impression of a Moon colony. Due to its proximity and relative familiarity, Earth's Moon is frequently discussed as a target for colonization. It has the benefits of close proximity to Earth and lower escape velocity, allowing for easier exchange of goods and services. A major drawback of the Moon is its low abundance of volatiles necessary for life, such as hydrogen and oxygen. Water ice deposits that may exist in some polar craters could serve as a source for these elements. An alternative solution would be to bring hydrogen from Earth and combine it with oxygen extracted from lunar rock. The Moon's low surface gravity (about one-sixth g) is also a concern. The Artemis Project designed a plan to colonize Europa, one of Jupiter's moons. Scientists were to inhabit igloos and drill down into the Europan ice crust, exploring any sub-surface ocean. This plan also discusses the possible use of "air pockets" for human habitation. The moons of Mars have been proposed as targets for space colonization. Low delta-v (change in velocity by the thrust of rocket engines) is needed to reach the Earth from Phobos and Deimos, allowing delivery of material to cislunar space, as well as transport around the Martian system. The moons themselves may be inhabited, with methods similar to those for asteroids. Titan has been suggested as a target for colonization, because it is the only moon in the solar system to have a dense atmosphere and is rich in carbon-bearing compounds. Locations in space would necessitate a space habitat, also called space colony and orbital colony, or a space station that would be intended as a permanent settlement rather than as a simple way-station or other specialized facility. They would be literal "cities" in space, where people would live and work and raise families. Many design proposals have been made, with varying degrees of realism, by both science fiction authors and engineers. A space habitat would also serve as a proving ground for how well a generation ship could function as a long-term home for hundreds or thousands of people. Such a space habitat could be isolated from the rest of humanity for a century, but near enough to Earth for help. This would test if thousands of humans can survive a century on their own before sending them beyond the reach of any help. Compared to other locations, Earth orbit has substantial advantages and one major, but solvable, problem. Orbits close to Earth can be reached in hours, whereas the Moon is days away and trips to Mars take months. There is ample continuous solar power in high Earth orbits, whereas all planets lose sunlight at least half the time. Weightlessness makes construction of large colonies considerably easier than in a gravity environment. Astronauts have demonstrated moving multi-ton satellites by hand. Zero-g recreation is available on orbital colonies, but not on the Moon or Mars. Finally, the level of (pseudo-) gravity is controlled at any desired level by rotating an orbital colony. Thus, the main living areas can be kept at 1g, whereas the Moon has 1/6g and Mars 1/3g. It's not known what the minimum g-force is for ongoing health but 1g is known to ensure that children grow up with strong bones and muscles. The main disadvantage of orbital colonies is lack of materials. These may be expensively imported from the Earth, or more cheaply from extraterrestrial sources, such as the Moon (which has ample metals, silicon, and oxygen), Near Earth Asteroids, which have all the materials needed (with the possible exception of nitrogen), comets, or elsewhere. A contour plot of the effective potential (the Hill's Surfaces) of a two-body system (the Sun and Earth here), showing the five Lagrange points. 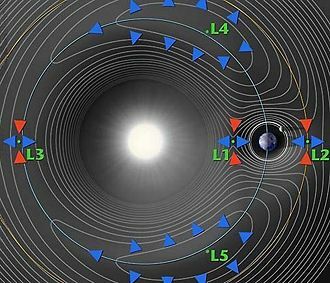 Another near-Earth possibility are the five Earth-Moon Lagrange points. Although they would generally also take a few days to reach with current technology, many of these points would have near-continuous solar power capability, since their distance from Earth would result in only brief and infrequent eclipses of light from the Sun. The five Earth-Sun Lagrange points would totally eliminate eclipses, but only L1 and L2 would be reachable in a few days' time. The other three Earth-Sun points would require months to reach. However, the fact that Lagrange points L4 and L5 tend to collect dust and debris, while L1-L3 require active station-keeping measures to maintain a stable position, make them somewhat less suitable places for habitation than was originally believed. Many small asteroids in orbit around the Sun have the advantage that they pass closer than Earth's Moon several times per decade. In between these close approaches to home, the asteroid may travel out to a furthest distance of some 350,000,000 kilometers from the Sun (its aphelion) and 500,000,000 kilometers from Earth. Colonization of asteroids would require space habitats. The asteroid belt has significant overall material available, although it is thinly distributed, as it covers a vast region of space. Unmanned supply craft may be practical with little technological advance, even crossing 1/2 billion kilometers of cold vacuum. One concern for the colonists would be to assure that their asteroid did not hit Earth or any other body of significant mass, yet they would have extreme difficulty in moving an asteroid of any size. The orbits of the Earth and most asteroids are very distant from each other in terms of delta-v, and the asteroidal bodies have enormous momentum. Rockets or mass drivers can perhaps be installed on asteroids to direct their paths along safe courses. Colonization of the entire Solar System would take hundreds or thousands of years. Looking beyond the solar system, there are billions of potential suns with possible colonization targets. For example, the star Tau Ceti, about eleven light years away, has an abundance of cometary and asteroidal material in orbit around it. It has been proposed that these materials could be used for the construction of space habitats for human settlement. The long-term survival of the human race is at risk as long as it is confined to a single planet. Sooner or later, disasters such as an asteroid collision or nuclear war could wipe us all out. But once we spread out into space and establish independent colonies, our future should be safe. There isn't anywhere like the Earth in the solar system, so we would have to go to another star. An interstellar colony ship would be similar to a space habitat, except with major propulsion capabilities and independent energy generation. Generation ship: A hypothetical starship that would travel much slower than light between stars, with the crew going through multiple generations before the journey is complete. Sleeper ship: A hypothetical starship in which most or all of the crew spend the journey in some form of hibernation or suspended animation. Embryo carrying Interstellar Starship (EIS): A hypothetical starship much smaller than a generation ship or sleeper ship, transporting human embryos in a frozen state to an exoplanet. Starship using nuclear fusion or antimatter propulsion. Project Orion: A concept proposed by Freeman Dyson that could use nuclear bombs to propel a starship. A continually accelerating starship: It would use a propulsion device such as a solar sail to approach the speed of light, allowing short subjective time to the crew, because of time dilation. The most famous attempt to build an analogue to a self-sufficient colony is Biosphere 2, which attempted to duplicate Earth's biosphere. Many space agencies build testbeds for advanced life support systems, but these are designed for long duration human spaceflight, not permanent colonization. Remote research stations in inhospitable climates, such as the Amundsen-Scott South Pole Station or Devon Island Mars Arctic Research Station, can also provide some practice for off-world outpost construction and operation. The Mars Desert Research Station has a habitat for similar reasons, but the surrounding climate is not strictly inhospitable. …the goal isn't just scientific exploration… it's also about extending the range of human habitat out from Earth into the solar system as we go forward in time…. In the long run a single-planet species will not survive… If we humans want to survive for hundreds of thousands or millions of years, we must ultimately populate other planets. Now, today the technology is such that this is barely conceivable. We're in the infancy of it… I'm talking about that one day, I don't know when that day is, but there will be more human beings who live off the Earth than on it. We may well have people living on the moon. We may have people living on the moons of Jupiter and other planets. We may have people making habitats on asteroids… I know that humans will colonize the solar system and one day go beyond. Spread life and beauty throughout the universe. Ensure the survival of the human species. Make money from solar power satellites, asteroid mining, and space manufacturing. Save the Earth's environment by moving people and industry into space. Provide entertainment value, to distract from immediate surroundings. Ensure sufficient supply of valuable materials that may soon be in short supply—materials such as natural gas and drinking water. Louis J. Halle, formerly of the United States Department of State, wrote in Foreign Affairs (Summer 1980) that the colonization of space will protect humanity in the event of global nuclear warfare. The scientist Paul Davies also supports the view that if a planetary catastrophe threatens the survival of the human species on Earth, a self-sufficient colony could "reverse-colonize" the Earth and restore human civilization. Author and journalist William E. Burrows and biochemist Robert Shapiro proposed a private project, the Alliance to Rescue Civilization, with the goal of establishing an off-Earth backup of human civilization. Another reason used to justify space colonization is the effort to increase human knowledge and technological abilities. There are some who object to the idea of colonizing space as being "too expensive and a waste of time." According to this view, there is nothing in space that is really needed, adding that moving beyond the solar system is totally impractical in any "reasonable" time scale. One pragmatic argument suggests that if even half the money of space exploration were spent for terrestrial betterment, there would be greater good for a greater number of people, at least in the short term. This argument assumes that money not spent on space would automatically go toward socially beneficial projects. It also assumes that space colonization is not itself a valuable goal. Some anti-space arguments have gone so far as to suggest that space colonization is a remnant of historical colonization, and the desire to conquer territory. It is even said by some that the objective of colonizing space adds fuel to the patriotic dogma of conquest, and thus reinforces negative national prejudice rather than helping to unify Earth. As an alternative or addendum for the future of the human race, many science fiction writers have focused on the realm of the "inner-space," that is the (computer aided) exploration of the human mind and human consciousness. The argument of need: The population of Earth continues to increase, while its carrying capacity and available resources do not. If the resources of space are opened to use and viable life-supporting habitats can be built, the Earth will no longer define the limits of growth. Since the population increase is projected to continue, living space is and will remain an important need for the foreseeable future. The argument of cost: Many people greatly overestimate how much money is spent on space, and underestimate how much money is spent on defense or health care. For example, as of June 13, 2006, over $320 billion had been allocated by the U.S. Congress for the war in Iraq. By comparison, NASA's yearly budget averages only about $15 billion a year. The argument of nationalism: Space proponents counter this argument by pointing out that humanity as a whole has been exploring and expanding into new territory since long before Europe's colonial age, going back into prehistory (the nationalist argument also ignores multinational cooperative space efforts). Also, seeing the Earth as a single, discrete object instills a powerful sense of the unity and connectedness of the human environment and of the immateriality of political borders. Moreover, in practice, international collaboration in space has shown its value as a unifying and cooperative endeavor. The literature for space colonization began in 1869, when Edward Everett Hale wrote about an inhabited artificial satellite. The Russian schoolmaster and physicist Konstantin Tsiolkowsky foresaw elements of the space community in his book, Beyond Planet Earth, written about 1900. Tsiolkowsky had his space travelers building greenhouses and raising crops in space. Others have also written about space colonies, such as Lasswitz in 1897, and Bernal, Oberth, Von Pirquet, and Noordung in the 1920s. Wernher von Braun contributed his ideas in a 1952 Colliers article. In the 1950s and 1960s, Dandridge Cole and Krafft Ehricke published their ideas. Another seminal book on the subject was the book, The High Frontier: Human Colonies in Space, by Gerard K. O'Neill in 1977, which was followed the same year by Colonies in Space by T. A. Heppenheimer. Paul Eckart wrote Lunar Base Handbook in 1999; M. Dyson wrote Home on the Moon; Living on a Space Frontier in 2003; and Harrison Schmitt published Return to the Moon, written in 2007. The Alliance to Rescue Civilization plans to establish backups of human civilization on the Moon and other locations away from Earth. The Colonize the Cosmos site advocates orbital colonies. The Artemis Project plans to set up a private lunar surface station. The British Interplanetary Society, founded in 1933, is the world's longest established space society. The Living Universe Foundation has a detailed plan in which the entire galaxy is colonized. The Mars Society promotes Robert Zubrin's Mars Direct plan and the settlement of Mars. The National Space Society is an organization with the vision of "people living and working in thriving communities beyond the Earth." The Planetary Society is the largest space interest group, but has an emphasis on robotic exploration and the search for extraterrestrial life. The Space Frontier Foundation promotes strong free market, capitalist views about space development. The Space Settlement Institute is searching for ways to make space colonization happen in our lifetimes. The Space Studies Institute was founded by Gerard K. O'Neill to fund the study of space habitats. Students for the Exploration and Development of Space (SEDS) is a student organization founded in 1980 at MIT and Princeton. Foresight Nanotechnology Institute—The space challenge. ↑ UC Berkeley News, Binary asteroid in Jupiter's orbit may be icy comet from solar system's infancy. Retrieved November 30, 2007. ↑ UNESCAP, Electric Power in Asia and the Pacific. Retrieved December 1, 2007. ↑ NASA, News-Features-the Story of Saturn. Retrieved December 1, 2007. ↑ BBC News, Move to new planet, says Hawking. Retrieved December 1, 2007. ↑ Washington Post, NASA's Griffin: 'Humans Will Colonize the Solar System.' Retrieved December 1, 2007. ↑ Robert Roy Britt, The Top 3 Reasons to Colonize Space. Retrieved December 1, 2007. ↑ Louis J. Halle, A Hopeful Future for Mankind. Retrieved December 1, 2007. ↑ E.E. Hale, The Brick Moon, Atlantic Monthly, 24. ↑ K.E. Tsiolkowsky, Kenneth Syers trans, Beyond Planet Earth (Oxford: Pergamon Press, 1960). ↑ G.K. O'Neill, The High Frontier: Human Colonies in Space (New York: Morrow, 1977). ↑ T.A. Heppenheimer, Colonies in Space (Mechanicsburg, PA: Stackpole Books, 1977). ↑ Marianne J. Dyson, Living on a Space Frontier. National Geographic (2003). ↑ Harrison H. Schmitt, Return to the Moon (New York: Springer, 2007). ↑ AlGlobus, Orbital Space Settlement. Retrieved December 1, 2007. ↑ The Space Settlment Institute, Home Page. Retrieved December 1, 2007. ↑ SEDS, Home Page. Retrieved December 1, 2007. ↑ Foresight Nanotech Institute, Enabling Space Development. Retrieved December 1, 2007. The Political Economy of Very Large Space Projects John Hickman argues that only government can afford the high initial investment for very large space development projects. PERMANENT Projects to Employ Resources of the Moon and Asteroids Near Earth in the Near Term; a guide to websites about asteroid mining and space settlement. Testimony of Michael D. Griffin Hearing on "The Future of Human Space Flight." Michael D. Griffin believes that the "human space flight program is in the long run possibly the most significant activity in which our nation is engaged." Island One Society—ideas about libertarian space colonization. National Space Society—non-profit organization that promotes a spacefaring civilization. Mars Foundation—Non-Profit Organization pursing public outreach and technology development for Mars settlement. This page was last modified on 14 October 2015, at 15:56.